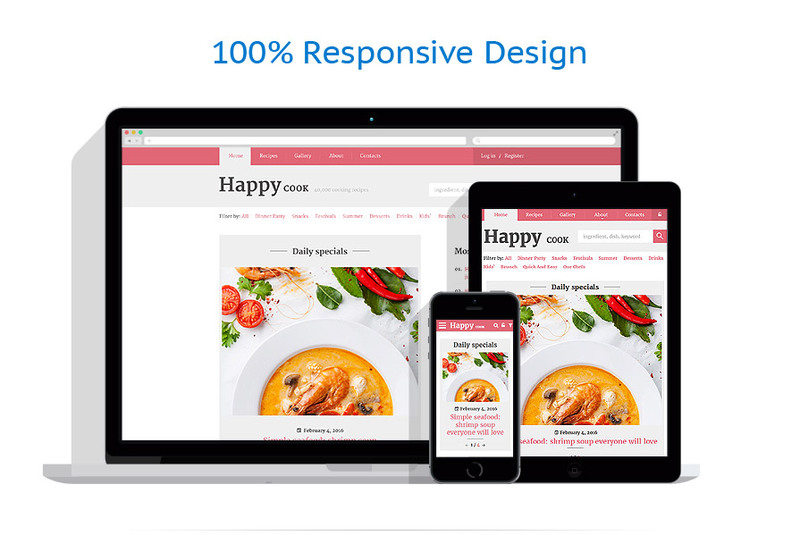 Happy Cook Website Template is a great choice for a recipes blog, cooking school online presence or a restaurant website. Fully responsive and cross-browser compatible, this web template has quite a number of amazing features to help you run your online business flawlessly. Just take a look at the live demo! Happy Cook is an aesthetically polished and user-friendly recipes website template. Its clean layout with plenty of negative space provides for better readability of your content. Its fully responsive framework ensures seamless performance of your website across a variety of devices. Fully functional, the theme's 2-column layout allows you to organize the latest blog updates and key navigation elements in a well-balanced way. Drop-down menu and integrated live search allow the users to reach the desired content in no time. A newsletter subscription form was also pre-loaded into the theme's pack. The theme is intended for cooking, cafe, restaurant, hobby, and family related websites.